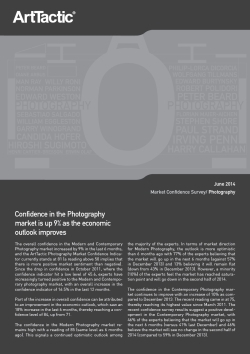 Confidence in the Photography market is up 9% as the economic outlook improves. The overall confidence in the Modern and Contemporary Photography market increased by 9% since the last reading in December 2013. The ArtTactic Photography Market Confidence Indicator currently stands at 81 (a reading above 50 implies that there is more positive market sentiment than negative). Since the drop in confidence in October 2011, experts have increasingly turned positive to the Modern and Contemporary photography market, with an overall increase in confidence of 16.5% in the last 12 months. The short-term outlook for the Modern Photography market looks optimistic, with 77% of the experts believing that the market will go up in the next 6 months (against 57% in December 2013) and 13% believing it will remain flat (down from 43% in December 2013). A minority (10%) of the experts feel the market has reached a saturation point and will go down in the second half of 2014. The confidence in the Contemporary Photography market continues to improve with an increase of 10% since December 2013, reaching the highest reading since March 2011.